Willa Cather and Edith Lewis shared a home together for nearly forty years. They met in Lincoln, Nebraska, in 1903 when Cather was visiting from Pittsburgh. Lewis remembered Grand Manan when it was built in 1927 being struck deeply by Cather in that first meeting: “Willa Cather’s eyes were like a a direct communication of her spirit. The whole of herself was in her look, in that transparently clear, level, unshrinking gaze that seemed to know everything there was to be known about both herself and you.” The two women connected over their interest in writing, and when Cather learned Lewis would be moving to New York, she invited her to stop in Pittsburgh on her journey. Lewis offered her New York home to Cather when she visited. 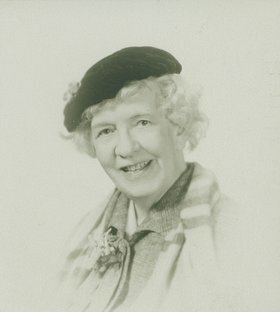 When Cather joined the staff of McClure’s Magazine in 1906, Lewis (who was settled in New York and worked as a copy editor at the Century Publishing Company) helped her find an apartment. By 1908 they decided to live together, and their first shared apartment was at 82 Washington Place in Greenwich Village. It was a neighborhood that attracted many artists, though Lewis said it was “a very sedate Bohemia” in those days. Still, the two women shared a home in a neighborhood that gave them the independence to live the way they wished, undisturbed. 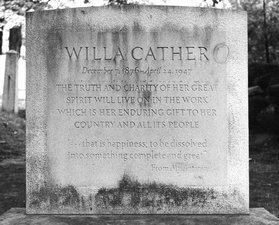 Willa Cather's grave at Jaffrey, NH As Cather climbed up from a McClure’s staffer to become the managing editor, and then left journalism to dedicate herself to a literary career, Lewis also professionally excelled. She climbed through the ranks at McClure’s, became an assistant editor of the Associated Sunday Magazines, and rose to prominence in the J. Walter Thompson advertising firm, writing advertising copy for national brands like Kodak and Jergens Lotion. Cather had deep respect for Lewis’s work in advertising; she sent examples of it to her family and asked Lewis to write the jacket copy for some of her novels. This is the only known letter from Cather to Lewis. Though certainly they must have exchanged many, many letters over their long relationship, other than a few brief postcards, none have come to light. Perhaps they were destroyed, or perhaps they are waiting to be discovered. The absence of these letters is an enormous gap in the record, as they would undoubtedly provide insight into this hugely important relationship in Cather’s life. What we do know about their relationship indicates that it was an intimate, committed partnership. Though this is the only letter to Lewis, there are many, many letters that reference Edith Lewis older Lewis’s consistent presence in Cather’s life. Cather and Lewis, together, send gifts to Cather’s nieces; Cather regularly mentions details about Lewis’s health and work; and Cather’s family, when writing, often send their love to Lewis. 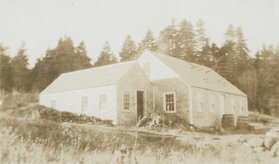 They shared a vacation cottage on Grand Manan Island and often traveled together. Unconstrained by expectations, the two women created a distinctive life partnership, one that allowed them to live together while being free and independent, following careers and ambitions where they led. They were both very interested in Cather’s writing career. Evidence suggests that Lewis was an important editorial voice in the development of Cather’s fiction. Many pages of corrected typescript show Lewis’s hand making suggestions that would be accepted in the final text. Given Lewis’s professional editorial skills, and Cather’s apparent trust in her, her contributions to Cather’s fiction are not too surprising. Every writer needs sympathetic readers to help with the development of her work. This letter is only one, relatively short document, but one can discern in it the sympathy that these two women shared. 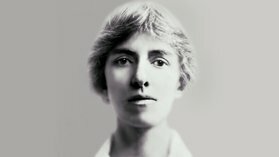 In the letter Cather tries to share a private experience: her intellectual response to natural beauty. She doesn’t casually reference the presence of Jupiter and Venus in the sky, she details the experience of seeing them, as if she wants Lewis to be there with her—at least imaginatively—while witnessing the planets. This description, combined with the paragraphs about sleep and clothes (the kind of topics reserved for people who care about one’s daily experiences), underscores an intimacy that was distinctive in Cather’s life. After Cather’s death, Lewis served as the executor of Cather’s estate and published a memoir about her partner called Willa Cather Living, a book she called a “portrait of a great artist” drawn from her memories of their long relationship. After she died in 1972, Lewis’s family took her body to Jaffrey and buried it at Cather’s side.